After a few times watching myself, my wife and friends play Magic, Maggie decided that she wanted a Magic deck of her own, and it was only natural for me to want to build her a Commander deck, themed around dinosaurs. Young children, of course, only have the vaguest of notions concerning formats, creature subtypes and the like, so the project was as much my own desire to see her happy with one of my hobbies as it was for Maggie to have a deck she could play with. Of course, the problems with creating a dinosaur-themed deck for a child are numerous, and we didn’t quite reach the finish line as a result. An obvious difficulty is that there are not many dinosaurs in Magic, certainly not enough for a hundred card singleton deck. The only creature to retain the ‘dinosaur’ it it’s oracle type-line is Old Fogey from Unhinged. 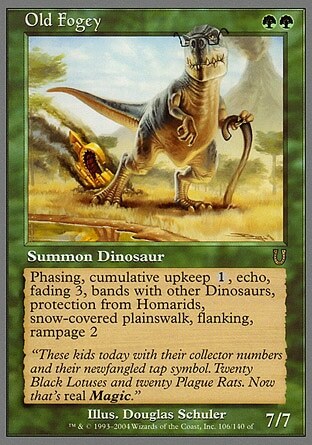 Since children don’t really care about the difference between oracle and printed text, we can also sneak Pygmy Allosaurus in to the list of actual cards with the word ‘dinosaur’ in Magic. Beyond that, we really have to dig deep for things that could be construed to be dinosaur, or mostly dinosaur. Allosaurus Rider strongly features a dinosaur in the card title and art. 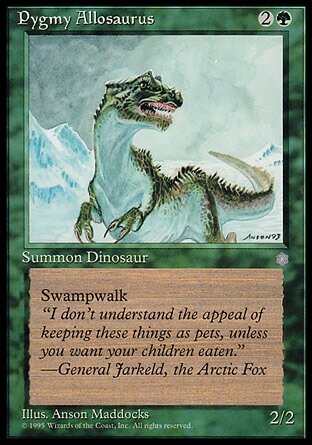 Imperiosaur is a real hidden gem; not only does it feature a creature that strongly resembles a Tyrannosaur, it’s actually not a terrible card, given that the deck will probably have a mostly basic land mana-base. The next step removed are creatures with the lizard subtype that are ‘probably’ dinosaurs. Macetail Hystrodon is a good analog of a Ankylosaurus, except it probably didn’t seem very hasty in real life, and probably did not strike first either. Shivan Raptor seems like a like a raptor, as does Frenetic Raptor and Ridgetop Raptor. Dromosaur and Brooding Saurian seem like dinosaurs, and could probably make the thematic cut. Sadly, this is where the list ends. The remaining dinosaur-like creatures are often fantastical, and not really suitable for a dinosaur-themed deck. Yes, you could play Fungusaur, Magmasaur, Pygmy Pyrosaur or even Putrid Raptor, but then we’re talking about creatures that are equal parts dinosaur and mushroom, molten rock, fire, or shambling corpse. The bottom line is that, even absent other considerations, there are simply not enough dinosaurs to go around. With that in mind, most of these are not really suitable for the very young Magic player who is making their first foray into reading, rather than being read to. Ideally, creatures would be vanilla, having minimal or have ‘invisible’ rules text. By ‘invisible’ rules text, I mean cards like Imperiosaur, who may as well not have rules text in a deck that only contains basic lands as mana sources. Minimal rules text might be like Pygmy Allosaurus, who is simply has swampwalk, while not being an actual English word has an intuitive game effect (“I walk on your swamp to bite you daddy!”). This kind of concern makes many of the others completely unsuitable. Frenetic Raptor has an effect on creatures of a particular type (and not just yours, your opponent’s beasts don’t block either). Shivan Raptor, for all it’s dinosaur-esque title and art (complete with big toe claw! ), is pretty rules-heavy (first strike, echo, AND haste). Which is to say nothing of the Old Fogey, whose text is meant solely as a joke. Even without being too picky, most of the cards here have fairly complex rules. Things like First Strike or landwalk I can get behind, but specialized rules text probably makes it unusable for the youngest kind of player. The third problem is fairly obvious. There is no legendary creature in red/green that really fits this deck, thematically. There is at least one elf, human, centaur, hellion, hydra, cyclops and giant in red and green with the Legendary type. But none of them are dinosaurs, or particularly lizard-like. Even so, there are no non-legendary red/green lizards for consideration either. The story ends here. My daughter has only played with sixty card decks and four-of cards with vanilla ‘boring’ creatures like War Mammoths and Craw Wurms. She usually likes to play other games, like the Dungeons and Dragons board games (Castle Ravenloft, Wrath of Ashardalon), or simpler children’s games. I can’t say I’m too disappointed with her Magic education, but, if there were only more dinosaurs, we’d have something special. At this point, I want to make a plea to Wizards. Magic needs more dinosaurs. This territory isn’t uncharted, but it’s definitely unexploited. Pygmy Allosaurus was a card in a ‘serious’ set, and originally had the dinosaur type. You were still clearly thinking of it in onslaught block, where Legions featured a large number of ‘beasts’ that strongly resembled dinosaurs. As late as Future Sight, you were willing to print Imperiosaur, even if you gave it the lizard subtype presumably because of the need for a consistent set of rules with a limited number of creature types (though, that didn’t seem to stop you from subsequently adding allies in Zendikar). The truth of the matter is that, without dinosaurs, I can’t guarantee that my daughter will have much interest in Magic. So, there needs to be dinosaurs in Magic, and they need to be (mostly) simple. And really, we’re talking dinosaurs. If you’re worried about marketing, it’ll sell about as well as ninjas, pirates and robots. Oh, and Wizards, if you could make some sort of legendary paleontologist in red and green, I’d be very much obliged.